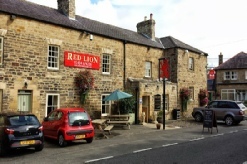 Andy Sue and staff welcome you to the Red Lion at Newbrough, an old coaching inn dating back to the 1190’s that has been brought back to the 21st century, whilst maintaining all the charm of a countryside bed and breakfast with its log and coal burners and comfortable chairs. Relax and enjoy local real ale, fine wines or other beverages available from the well-stocked bar. We have two restaurants; the Stable and Beattie’s, both have log fires and a homely atmosphere. We offer a selection of freshly made food with a twist; the Red Lion prides itself on providing very high quality delicious food. The menu is seasonal and the produce is locally sourced, our cod and mackerel are caught off the Seahouses and Beadnell coast, only an hours’ drive away and well worth a visit.